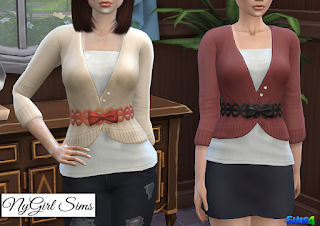 I was totally in love with the new dress that came with the Dine Out Game Pack so I decided to take the sweater from it and turn it into a standalone top. I started it early last week but due to a heavy week and weekend schedule I was unable to finish it until this morning. Mesh by me. Comes in all EA presets as well as 2 additional color combos. This shirt is base game compatible and enabled for all genders.